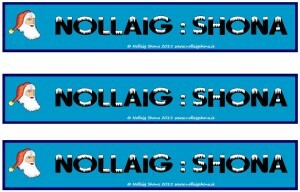 Printable bookmarks with the words “Nollaig Shona” and a Santa illustration. Bookmarks are a good incentive for reading for pleasure and it’s good to encourage pupils at this time of the year to continue reading for pleasure. There are three bookmarks per page. If you find that the bookmark is still too large, set your printer options to print two pages per page. 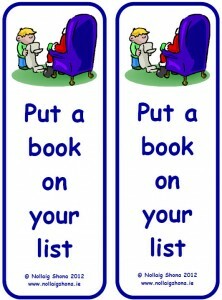 Printable bookmarks with the motto “Put a Book On Your List”. Bookmarks are a great incentive for reading for pleasure and it’s good to encourage pupils at this time of the year to continue reading for pleasure. There are two bookmarks per page. If you find that the bookmark is still too large, set your printer options to print two pages per page. 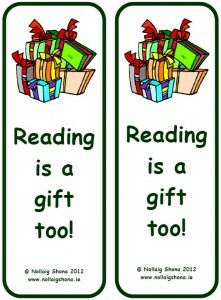 Printable bookmarks with the motto “Reading is a Gift Too!”. Bookmarks are a great incentive for reading for pleasure and it’s good to encourage pupils at this time of the year to continue reading for pleasure. There are two bookmarks per page. If you find that the bookmark is still too large, set your printer options to print two pages per page. 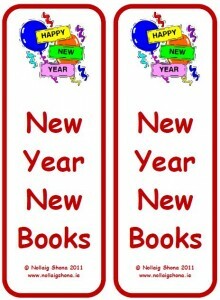 Printable bookmarks with the motto “New Year New Books”. 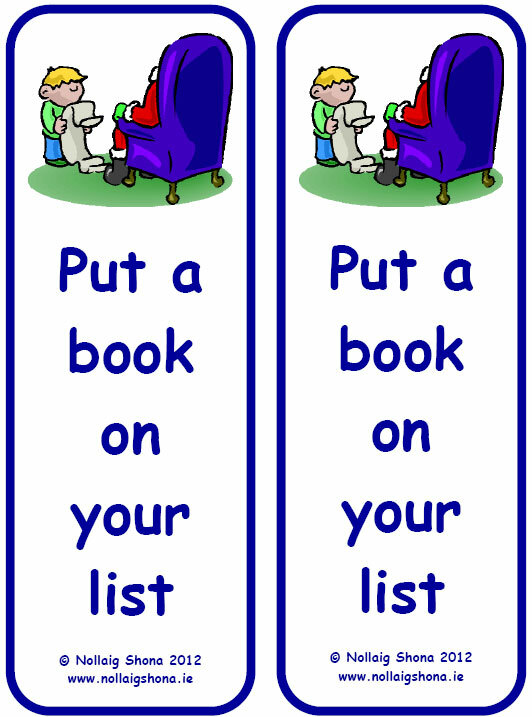 Bookmarks are a great incentive for reading for pleasure and it’s good to encourage pupils at this time of the year to continue reading for pleasure. There are two bookmarks per page. If you find that the bookmark is still too large, set your printer options to print two pages per page. 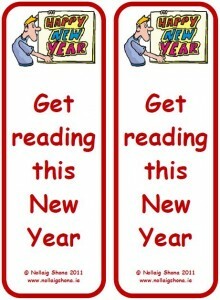 Printable bookmarks with the motto “Get Reading This New Year”. Bookmarks are a great incentive for reading for pleasure and it’s good to encourage pupils at this time of the year to continue reading for pleasure. There are two bookmarks per page. If you find that the bookmark is still too large, set your printer options to print two pages per page. 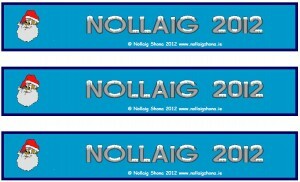 Printable bookmarks with the words “Nollaig 2012” and a santa illustration. Bookmarks are a good incentive for reading for pleasure and it’s good to encourage pupils at this time of the year to continue reading for pleasure. There are three bookmarks per page. If you find that the bookmark is still too large, set your printer options to print two pages per page. 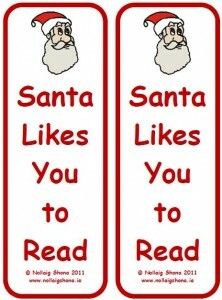 Printable bookmarks with the motto “Santa Likes You to Read!” Bookmarks are a good incentive for reading for pleasure and it’s good to encourage pupils at this time of the year to continue reading for pleasure. There are two bookmarks per page. If you find that the bookmark is still too large, set your printer options to print two pages per page. Two bookmarks per page with the word “Christmas”. Bookmarks are a good incentive for reading for pleasure. Two bookmarks per page to colour with the words “Color it Christmas”. Bookmarks are a good incentive for reading for pleasure. 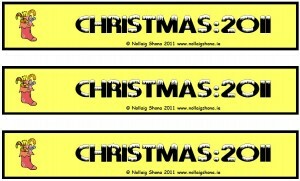 Three bookmarks per page with the words “Christmas 2011″ and a Christmas Stocking illustration. Bookmarks are a good incentive for reading for pleasure.